We have a fantastic caravan for hire. 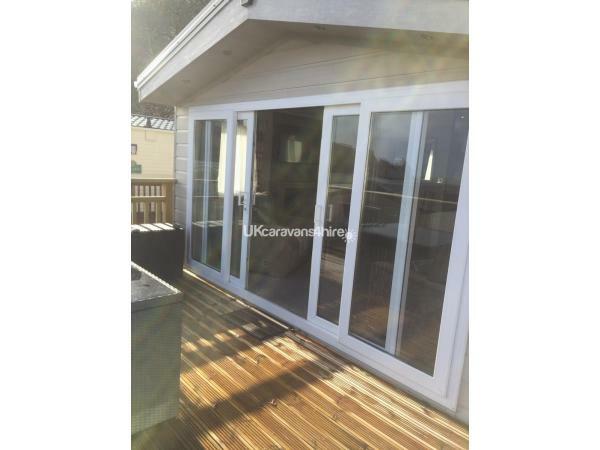 It is a 2017 top of the range model with a master bedroom and en-suite with fitted wardrobes. There are a further 2 twin bedded room and a double sofa bed in the lounge which is perfectly comfortable. 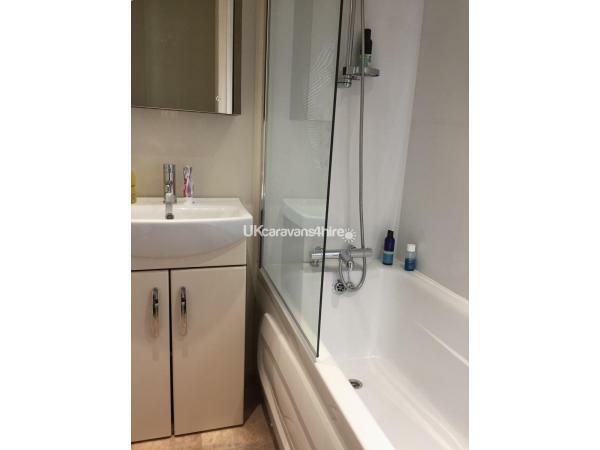 There is a full sized bath + shower and the kitchen is kitted out with an American Fridge Freezer and integrated dishwasher, microwave and washing machine/tumble drier. 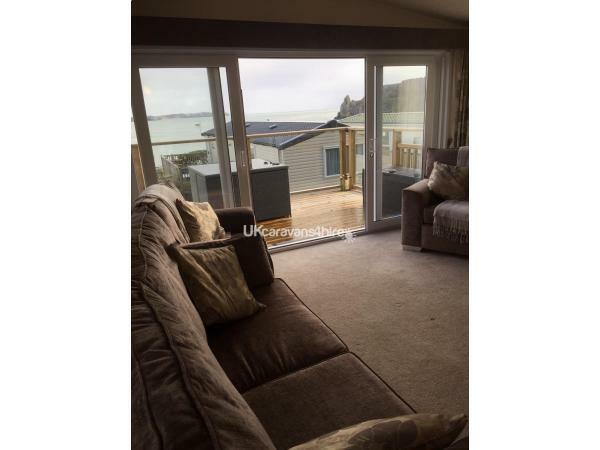 There is a dining area off the kitchen leading into the lounge with TV and DVD and large patio doors out to the decking with unrivalled sea views. We are a couple of minutes stroll from the private beach at Lydstep which is a blue flag beach and is always quiet. We are also just a couple of minutes away from the Club House and all its sporting and entertainment facilities. Lydstep is ideally situated for coastal and countryside walks and the towns of Tenby, Saundersfoot, Pembroke and St Davids. 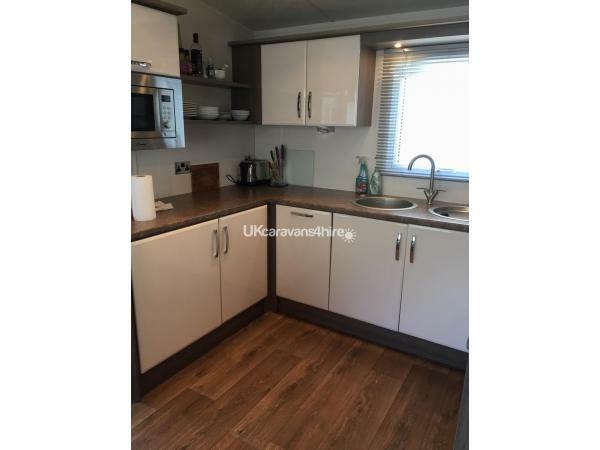 caravan was amazing , spacious , clean with amazing views of the beach, we will definitely be returning next year fabulous holiday , it was also fantastic i was able to take my little dog , beautiful caravan thankyou Jane. Thank you so much Deb - so glad you enjoyed it and it would be great to have you back next year. 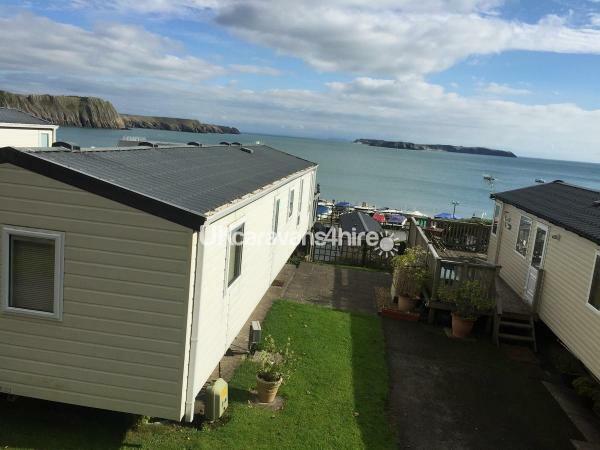 Beautiful caravan in a fab location with gorgeous view over the bay. Lovely spacious living room/kitchen. Good sized twin rooms and fab ensuite double room. Extremely comfy beds. Lots of storage. Fenced off/decked area ideal for containing our 3 year old son/7 year old labrador and to relax and enjoy the view. Having a week of glorious weather definitely helped with the holiday itself but having such a fantastic base for the week made it all the better. The owner Jane was very lovely and extremely helpful throughout the booking process and the holiday itself. On site facilities are great. Good reasonably priced shop, nice pool, small arcade and lovely food at the manor. Entertainment was good and all the staff are lovely. Would highly recommend staying at this caravan ???????? Thank you Rhea for lovely review- so glad you had a good time. WE HAD THE GREAT PLEASURE OF STAYING HERE LAST SEPTEMBER 2017. 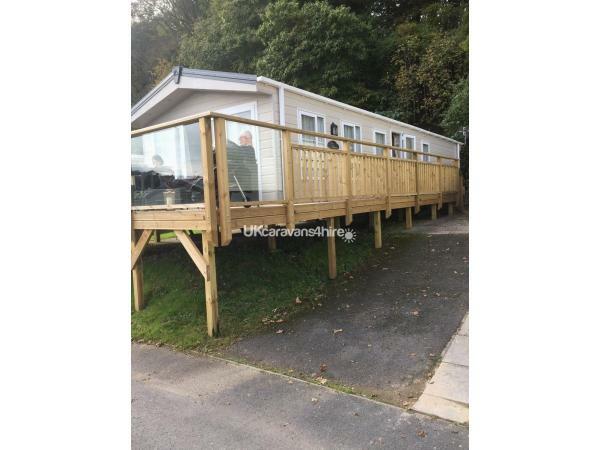 WE WERE BOTH SO IMPRESSED WITH THE HIGH STANDARD OF ACCOMMODATION AND THE FACILITIES OF LYDSTEP BEACH VILLAGE. EVEN THOUGH THERE WERE RAINY DAYS THE STUNNING BEACH, VIEWS AND WALKS MORE THAN MADE UP FOR THE FEW RAINY DAYS. I THOROUGHLY ENJOYED MY TIME HERE AND HAD SOME OF THE BEST NIGHTS SLEEP THAT I'VE HAD IN A LONG WHILE DUE TO THE QUALITY OF THE BEDS. THE STAFF ARE VERY FRIENDLY AND HELPFUL AND WE HAD SO MICH FUN EXPLORING THE LOCAL AREAS IN PARTICULAR AS THE TENBY IRON MAN CONTEST WAS HAPPENING THAT WEEKEND. PRIOR TO STAYING HERE I HAD NO IDEA THAT STAYING IN A CARAVAN COULD BE SUCH A GLAMOUROUS AFFAIR. WE CAME BACK REALLY REFRESHED AND I'M LOOKING FORWARD TO VISITING AGAIN IN THE FUTURE. MY HUSBAND AND I THOROUGHLY RECOMMEND THIS PLACE AND THE BOOKING PROCESS WAS SIMPLE.